These peppermint pinwheels are made of chocolate and peppermint cookie doughs swirled together for the perfect slice and bake Christmas cookie! More cookies today! Because it’s the Christmas season and, well, it just seems like the thing to do. Lots and lots of baking. There’s just so many amazing Christmas treats. I think that’s the problem with making so many of these things only once a year. You end up with this list a mile long of all the things you want to have for Christmas and the result is way too much baking! It’s a good thing there’s always so many places to bring all the treats to and give them away so that I don’t end up with Christmas baking in my freezer in June! This peppermint pinwheel cookie recipe is not an old favourite like my whipped shortbread one is. I actually found this one in a magazine that I randomly grabbed off the shelf at the library as I was walking by a few years ago. I think I actually only tried one recipe out of that magazine, but it has stuck around as a new family favourite every Christmas! You just can’t go wrong with peppermint and chocolate. It really is one of my favourite combinations ever – if mint chocolate is an option you better believe it’s the one I’m taking. Although that’s maybe obvious with the over abundance of mint chocolate things around here – homemade mint thins, chewy chocolate mint chip cookies, and chocolate mint popcorn to name a few! These cookies do take a bit of time but all the steps are very simple. 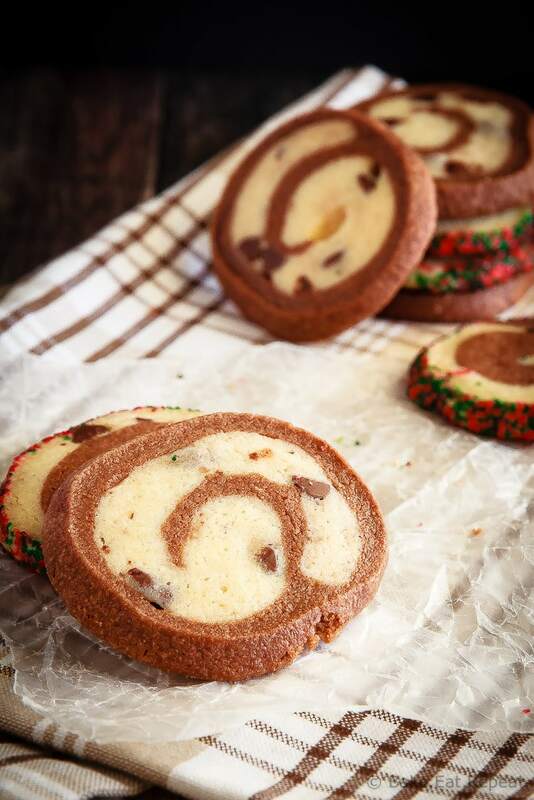 Mix the dough up, divide it in half and flavour each portion, chill, roll it out and form it into swirly logs, then chill again, slice, and bake. You can definitely let the dough chill overnight and then slice and bake the next day if you want to break it up a bit though. I could eat these peppermint pinwheels all year long (peppermint isn’t a seasonal thing in my world! ), but they remain one of those cookies that is relegated to Christmas at my house. And maybe that’s part of what makes them special, along with the whole long list of Christmas treats. Everything is more special when you only have it once a year! If you love the peppermint and chocolate combo, you will definitely love these peppermint pinwheels. So if you would like your Christmas treat list to get just that little bit longer this year – try them out! They’ll probably stick and become a favourite for you too! Updated Dec 12/16, originally posted Dec 10/14. In a large bowl, or in the bowl of a stand mixer, cream together the butter and sugar until smooth. Add the egg and vanilla and mix until well combined. Add the baking powder, salt and flour and mix well. In a small microwave safe bowl, melt the semi-sweet chocolate. Microwave at 50% power for 30 second increments, stirring after each 30 seconds, until just about melted. Continue to stir the chocolate until it is fully melted, making sure not to overheat it or it will seize. Divide the dough into two equal pieces, and add the melted chocolate to one half. Mix until the chocolate is completely incorporated into the dough. To the other half of the dough, add the chopped layered mint chocolates and the peppermint extract. Mix until well combined. Divide both the chocolate dough and the peppermint dough into two pieces each. Wrap each of the 4 pieces of dough tightly in plastic wrap and refrigerate for at least 1 hour, or until it is easy to handle. Roll out each piece of dough into a 9 by 6 inch rectangle between two pieces of wax paper. Peel off the top pieces of wax paper, and using the bottom piece, invert one rectangle of peppermint dough on top of one rectangle of chocolate dough. Remove the top piece of wax paper, and use the bottom one to help roll up the two layers of dough, starting from the long side, and pinch the edges to seal. Repeat with the other two dough rectangles. If you want, you can roll the logs in sprinkles to coat the edges of the cookies. Wrap each roll in plastic wrap and refrigerate for 2 hours, or overnight, until firm. Preheat the oven to 375 degrees F. Unwrap the dough rolls and cut into 1/4 inch slices. Place about 2 inches apart on an ungreased cookie sheet. Bake for 8-10 minutes or until the edges are firm. Allow to cool for 5 minutes on the cookie sheet and then transfer to wire racks to cool completely. Cookies will keep in a sealed container at room temperature for 7 days, or can be frozen for up to 3 months. You can use either baking chocolate or chocolate chips for the chocolate, but I prefer to use baking chocolate as it melts better. If you can’t find the Andes layered mint chocolates (I sometimes have a really hard time finding them! ), mint chocolate chips are a good substitute (that's actually what's shown in the photos here because I couldn't find the Andes ones this year!). The prep time does not include chilling time. Source: Slightly adapted from Better Homes and Gardens . Absolutely stunning! Would Heath bits work instead of mint chips, do you think? Thanks Stephanie! I'm sure Heath bits would work just fine. Did you want the toffee/peppermint combination though (that could be good!)? If not you could omit the peppermint extract and just have a chocolate/toffee pinwheel cookie. I'm sure that would be wonderful! Let me know if you try it! YES!! LOVE these!! Very clever twist on a classic. Of course! I bake far too many cookies at Christmas time so I will definitely be bringing a big tray - get them out of my house! Yep, that's awfully close! No idea if that's where I got it from or not, but that'll work for giving a credit to someone! Thanks! Guess I should have just googled it, that never occurred to me for some reason since it was quite a while ago! Thanks Becky! These are gorgeous, Stacey! Wow. I'm loving the cookie action. I don't see the point to baking anything healthy in December, either! 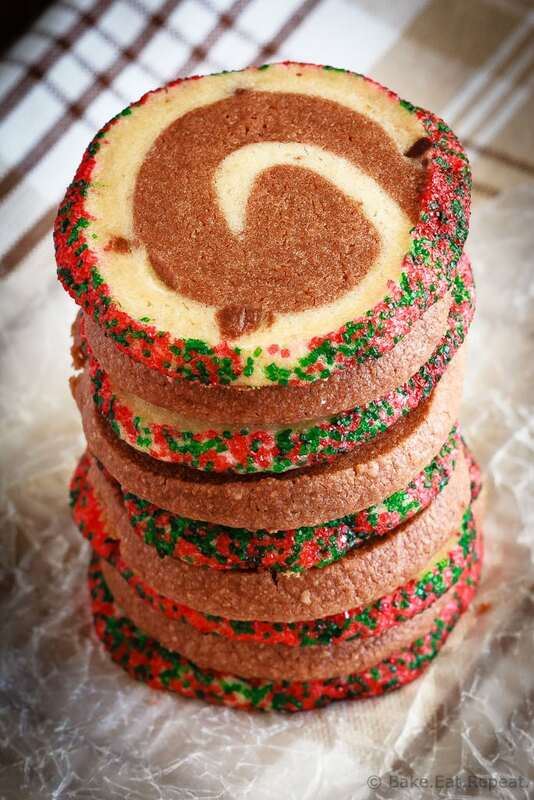 These pinwheel cookies look awesome! I definitely am inspired to try out the recipe.. I am just loving the peppermint and chocolate flavour! Can't go wrong with peppermint and chocolate, it's the best combination! Especially at Christmas time. Thanks Thalia! Oh my gosh Stacey, these pinwheel cookies are gorgeous! I have always wanted to make them and always run out of time before Christmas! The chocolate and peppermint combo are perfect! I need to add these to my holiday cookie list - love them! I have always been intimidated by pinwheel cookies and put off making them, but after seeing this I think I am going to have to give them a try. They look incredible. Thanks! Definitely try them Dannii! They take a little longer than regular cookies, but seriously, all the steps are easy. And it's okay if they don't look perfect anyways, they still taste amazing! Oh, I totally remember that magazine cover too! Just kidding - no clue. Haha! I do that all the time though - tear out a recipe when I'm flipping through a magazine at a doctor's office or something and then later have no idea where it came from! I am making pinwheels this week too, but totally different flavors. I just love how they look. The swirl is so cute and pretty. Yours are perfect! I'm all in for chocolate-peppermint EVERYTHING right now! These look divine! Haha, good, glad to hear I'm not alone on pretty much ignoring health food in December! Thanks Manali! I love pinwheel cookies Stacey! These are extra special, because there is chocolate in them! Can't wait to try them! Thanks Mira! Everything is better with chocolate right?! Oh man, I feel like all of the weight I've gained in the last 2 months is from all the Christmas baking and NOT because of the baby -- I definitely don't have much for healthy recipes coming up either! Lol. Though I feel like I should probably start working on some lighter recipes for January, all I want to do is bake naughty things! These cookies look perfect -- chocolate and mint is one of my favorite combinations! Yep, I never feel like making healthy things in December, so I'll just be making lots of salads in January I suppose. :) Thanks! Gosh...I just love these pinwheels! And the chocolate peppermint combination is perfect! Thanks Annie! Chocolate peppermint is one of my favourite combos, so good! I love the looks of these peppermint pinwheels, Stacey! I've never had a cookie like this before, so I love this! The chocolate sounds like it pairs so perfectly with the peppermint. And totally worth the extra time that it takes to make these cookies! Pinned! Thanks Gayle! Chocolate and peppermint just belong together in my opinion! :) Thanks for pinning! These pinwheels are total stunners. 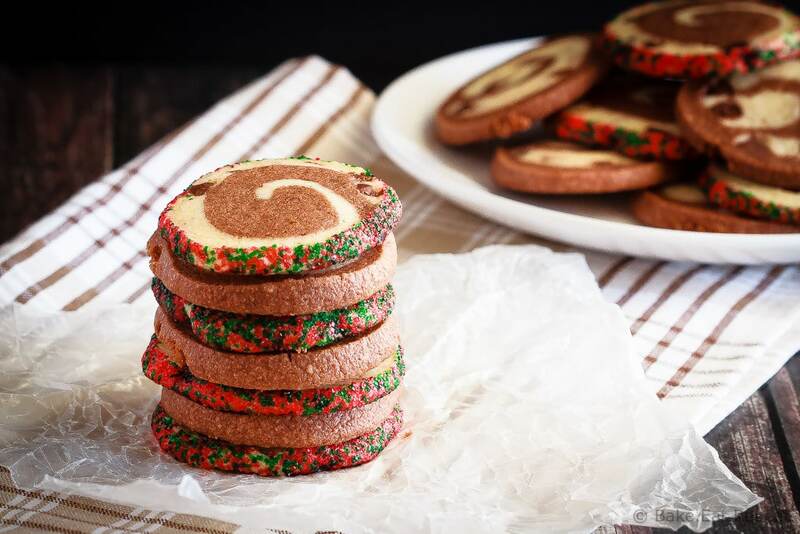 Cookies like this are perfect for the holidays - impressive and freeze well!